Two weeks ago I attended the New York City Horror Film Festival taking in 19 films in 3+ days. The film that won Best Feature was Night of Something Strange, co-written and directed by Jonathan Straiton. 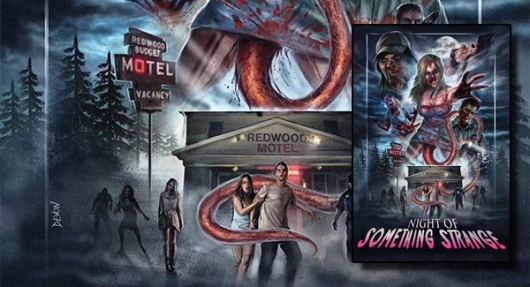 It featured some of the craziest scenes imaginable in modern horror, while telling the story of an STD that turns people in zombie-like monsters who desire to spread the disease the ol’ fashioned way. Getting caught in the middle are a group of horny high schoolers out for Spring Break. What caught my eye, was the poster which instantly transported me back to the 80s, and digging through aisles of VHS tapes in the horror section. I got a chance to speak with Straiton this week, right as the film was about to hit iTunes.